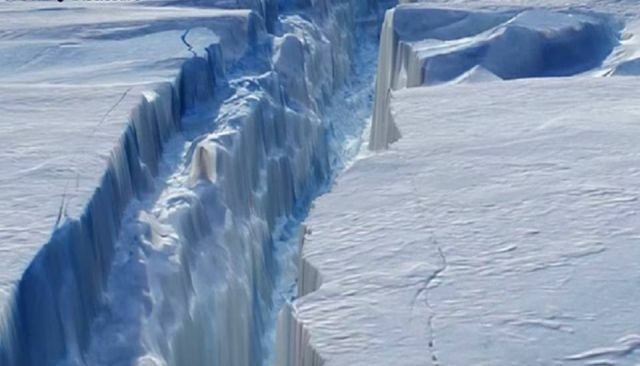 Enormous 130 km crack spreading across Antarctic ice shelf - Edgar Cayce foretold it already! "The earth will be broken up in many places. The early portion will see a change in the physical aspect of the west coast of America. There will appear open waters in the northern portions of Greenland. There will be seen new lands of the Caribbean Sea... South America will be shaken from the uppermost portion to the end; and in the Antarctic off Tierra del Fuego will be land, and a strait with rushing waters." Scientist monitoring a gigantic crack in one of the world’s great ice shelves in Larsen C in Antarctica. Larsen C is only “slightly smaller than Scotland” according to researchers, and is entirely covered by ice that is floating in deep ocean waters. The crack in the ice is both expansive and deep, measuring some 70 miles long and 300 feet wide. Once the crack spreads across the entire ice shelf it will produce an iceberg roughly the size of the state of Delaware at over 2,400 miles. The progression of which has been continuously monitored by scientists. From 2011 to 2015, the crack grew 30 kilometers, and was 200 meters wide by 2015. Between March and August 2016, the rift grew another 22 kilometers and widened to 350 meters, according to Project Midas, a research collaboration funded by the British Antarctic Survey. With the full length of the rift now at 130 kilometers, researchers predict a big chunk - about 10 percent of the ice shelf is going to break off very soon. The partial loss of Larsen C will not itself raise sea levels. But ice being held back by the shelf may flow faster into the sea and contribute to its global rise, reports the Washington Post. If such a gigantic part of Antarctica breaks off and water levels around the world will rise, what could be the impact for some countries? A recent study says we can expect the oceans to rise between 0.8 and 2 meters, enough to swamp many of the cities along the U.S. East Coast, reports Ecowatch. A complete meltdown of the Greenland ice sheet, push sea level rise to 7 meters, enough to submerge London. Video below:These are the top 10 countries threatened by a 6 meter sea level rise we are almost guaranteed to see in the not-too-distant future, according to the projected pace of global warming and ice melt in Greenland and Antarctica.